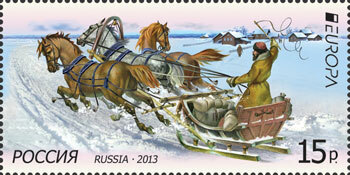 The Russian Post is one of the oldest in Europe, it started in the 9th-10th centuries. The coachman driving was used to deliver written messages; it was a system of postal yards (yams), connecting cities of Russia with Moscow. In the first half of the 18th century the coachman driving gave place to post troikas among the advantages of which there were high speed, endurance, large capacity and good passability. The era of famous Russian troikas came to an end when horses were replaced by the railway transport and cars. In the 20th century, the troika lost its national importance at all, but nevertheless it remains popular as a constant attribute of folk festivals. Size of stamp: 65х32,5 mm. Form of issue: sheet with illustrated margins of 8 (2х4) stamps. Circulation: 400 thousand copies (50 thousand sheets).